Easy to spread from the fridge with a buttery taste and half the saturated fat, ‘I Can’t Believe It’s Not Butter’ is a tasty, convenient alternative to butter. The definitive impersonator of butter has been available to buy since 1986, its success largely thanks to advertising featuring the famous Spitting Image ‘cow puppets’ and Ozzy Osbourne. With their bubbly typography and garish palette – even their content of margarine – the tubs of ‘I Can’t Believe It’s Not Butter’ still gracing supermarket refrigerators today seem things of the past; perhaps lost to the eighties, when the open plan kitchen became the homey hub of the house and chintz worked in just about every room. Not only are these butter imitators evocative of a time gone by, but they are also signs of late capitalist mass production, a health-crazed generation fixed on improving nature with science, and our continuing obsession with replacing the ‘real’ with a cheap substitute. So blatant in its fakery, the sorely colloquial and drawn out brand name is asking to be subverted. Tempted by this offer, Domestic Fakery replaces the fake butter from three tubs with fake(r) butter – tinted plaster – its surface seductively sheening and impaled with a knife poised for action. Reducing plaster (the stuff of ‘great art’) to mere culinary matter creates a bathetic turn. Their multiplicity enforces this inanity, and in turn the ridiculousness of the product and the somewhat disturbing concept it represents. 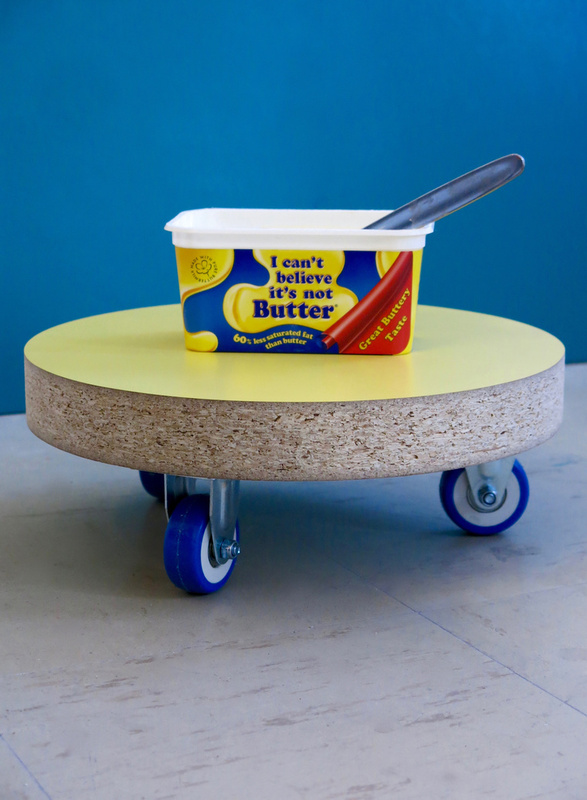 To render them even more defunct, the tubs ride on plinths fashioned from laminate kitchen worktops in a brilliant canary yellow, mobilised by rubber castors. Cadmium, aureolin andlemon yellow; water-soluble varnish. You would never own morethan one butter. Wheels suggestprogression, movement and functionality contrary to a plinths traditional role– to enable the static observation and appraisal of ‘art object’.